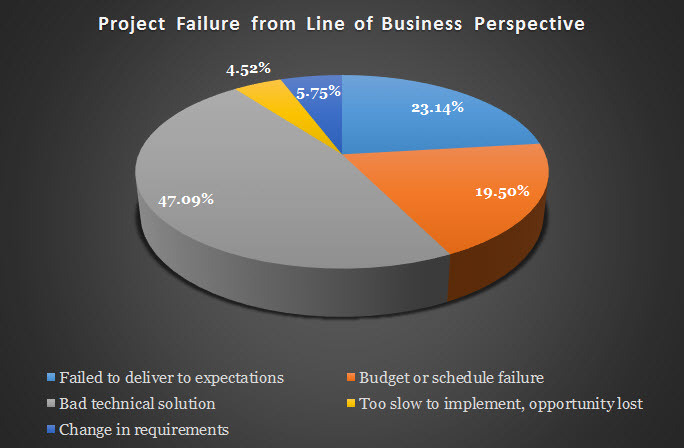 An exploration of perception of failure on projects in the SIL database shows that a large majority of line of business (LOB) executives blame the technology for the failure of their projects. This view into 503,227 projects in the last 4 years shows how perceptions can force conclusions and conceptual frameworks. The practice of business blaming technology has grown to be a default stance in many organizations and forms a lot of the business competitive view of their supposedly-supporting IT departments. 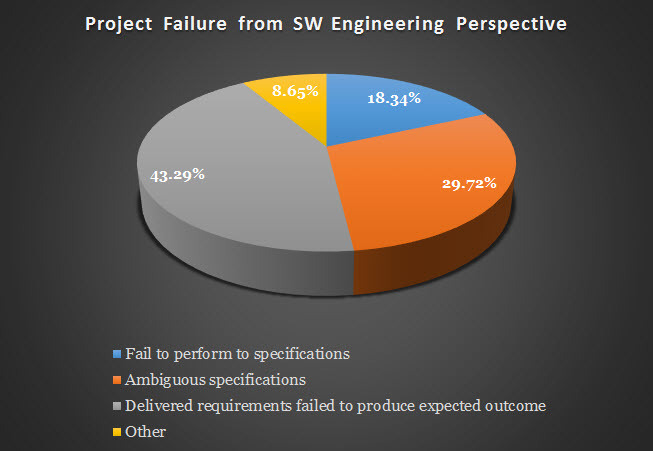 If the same projects are viewed from the software engineering side, the reasons attributed to the failure are significantly different. It is not only the distribution of the causative factors, but the actual conceptual framework that differs. The language and the concepts behind the languaage are different. This dichotomy of perspective encapsulates the difficulties of getting the LOB and the tech side to agree on pretty much anything. If the two charts are compared, the difficulties in building a common communications "translation" can be readily imagined. Keeping the communication channels open becomes a critical success factor, while the charts resulting from this recent analysis provide a clear image of the price of internal organization communications shortfalls.